Arabs hurled rocks at Jews praying at the Temple Mount Friday. Kotel Cam recorded the incident. Worshipers at the Kotel (file). 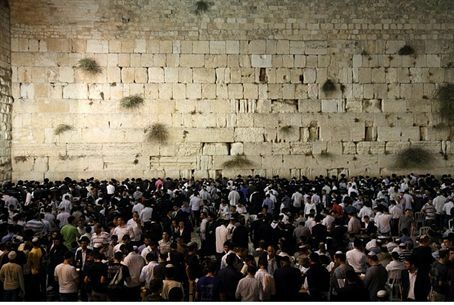 Muslims threw rocks at Jewish worshipers praying at the Kotel after Friday’s Muslim prayers. No one was reported hurt. The incident was captured on the Western Wall Keritage Fund’s Kotel cam, which transmits live video of the Kotel Plaza over the Internet. Worshipers at the Men's Section are seen scattering and returning to the Wall a short time later. The violence occurred after security forces decided to allow Muslims under the age of 50 to participate in the Friday prayers. Usually, men younger than 45 or 50 are barred from praying on the Mount if there is an intelligence assessment that riots are being planned. Police stormed into the Mount, used means of riot dispersal against the Muslim attackers and arrested three of them. The Palestinian Authority has demanded control of the Temple Mount be handed over to it, and there have been reports that U.S. President Barack Obama supports this idea. However, incidents like the one on Friday have convinced many in Israel that the Muslims would not honor the rights of other religions if they were given power over the holy sites. Veteran Jerusalemites have testified that before Jordan occupied the Wall in 1948, Arabs had a habit of intentionally driving their donkeys through the crowd of Jewish worshipers at the Kotel in order to harass and humiliate them. Arabs have also repeatedly ransacked the Tomb of Joseph in Shechem and recently gunned down a Jewish man who had come to pray there.